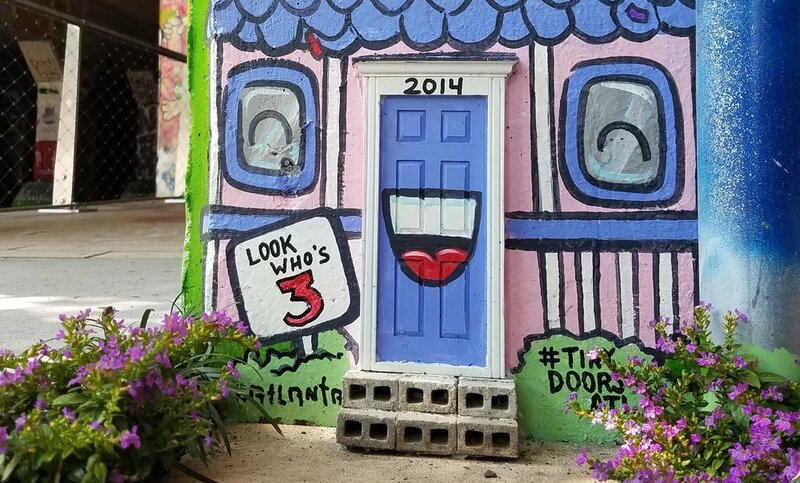 Tiny Doors ATL is a Atlanta-based public art project “bringing big wonder to tiny spaces” by installing 7-inch tall doors around Atlanta that are free to visit, accessible to all, and made for all ages. Karen Anderson, the principal artist and director of the project, and Catlanta brainstormed ideas and teamed up to paint Tiny Door #1 in July 2017. Located at entrance to the Krog Street Tunnel, Tiny Door #1 has been painted by multiple artists over the years to reflect the ever changing murals inside the tunnel. For this mural, a design was chosen that highlighted the houses in the neighborhood in addition to celebrating the three year anniversary of Tiny Doors ATL. This tiny mural was on display from July 2017 to March 2018 and was replaced by another Tiny Doors collaboration with the Lotus Eaters Club upon removal.